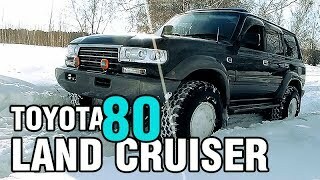 1997 Toyota Landcruiser 80 series VX Amazon turbo diesel - Review, Walkaround and Test Drive! 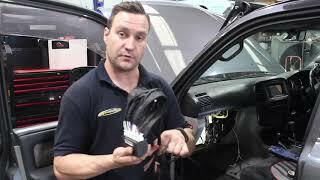 “In this episode of the Luxury Car Report the perfect mixture of luxury and utility. 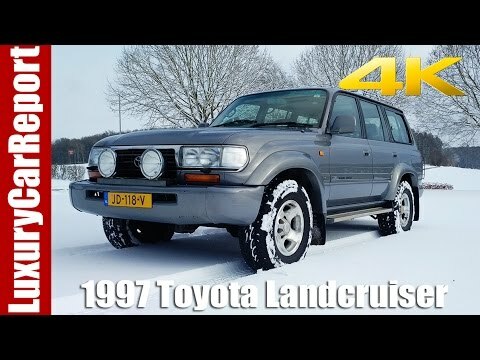 Enjoy the winter special of the '97 Toyota Land Cruiser!" 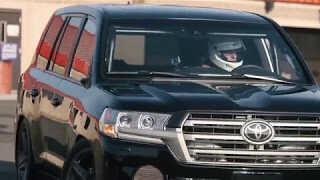 Our tester for this episode is a raw beast, equipped with 4.2 liter inline six turbo diesel engine. While 170 hp and 280 lb ft of torque for pulling 5000 pounds of car doesn’t make it a spectacularly fast car, it is hard to beat its off-road performance. And additionally to its own weight, you can hook up a whopping 7.700 pound trailer to this thing! 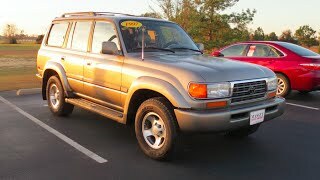 That’s another Land Cruiser and a half. 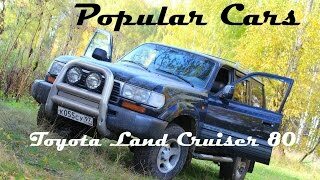 The Land Cruiser is Toyota’s longest running series and it dates all the way back to 1941. 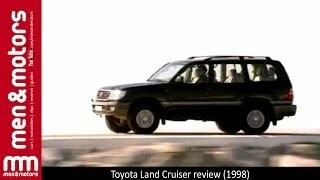 This particular vehicle series, the Land Cruiser J80, was built from 1990 to 1998 and came initially in 2 trim levels: an entry level model and the loaded VX. We’re testing the VX Amazon! 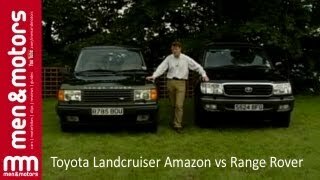 So what would best define the Land Cruiser? 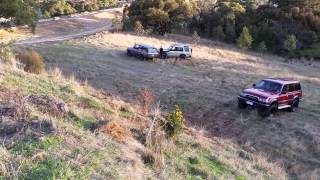 Is it an off-road utility vehicle, or a luxury car? It really is both, or maybe neither. It has most of the luxuries on board one could dream of in 1997, so it is far from pure utilitarian. At the same time, it isn’t really refined either and those luxuries aren’t in the way of its off-road performance. "So the way this thing drives is… well first of all, it’s a huge diesel, so it feels sort of like a van or, more like a bus actually. And the steering is quite vague. It’s very mushy. If I steer like this, nothing really happens." *And* the Toyota Land Cruiser is huuuge, which makes it hard to maneuver in tight spots. "And now I have to turn this beast around, which is quite a challenge on itself. You hear this alarm? This is really a bus!" On the other hand, with a tank like this Land Cruiser, you can also just opt to go straight ahead wherever you go. The 4.2 diesel pulls the Land Cruiser from 0 – 60 in 12.7 seconds which isn’t spectacular, but we’d say is adequate for this kind of car. 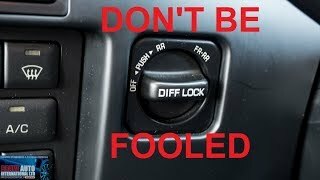 "Actually, the diesel engine is more powerful than I thought, because I forgot to release the hand brake." 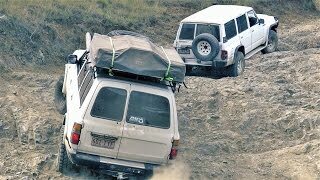 "Our 1997 Toyota Land Cruiser is a five plus two seater, expandable with two removable seats… that lock into place in the trunk." With all seats moved out of the way, the Land Cruiser provides a massive 90.9 cubic feet of cargo space, equaling 2574 liters. And look at the fancy hooks they’ve created to secure all the folded seats! The passenger area is less spacious than you’d expect from such a large car. Actually, being 6 foot 8, it was even a bit cramped for me. We had no complaints about the plush leather seats however. 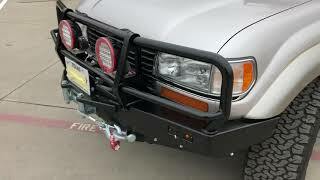 These feel right in place with a luxury SUV! The driver’s seat is equipped with more luxury that you’d expect from a workhorse like this. It has adjustable seats including an adjustable lumbar support. The steering wheel is also adjustable to match each individual, small or tall. In the rear you don’t have to fight over the armrest anymore, because there are 2! We were also impressed by the accuracy of the faux wood; the different pattern around the ash tray made it look sophisticated. Until you open it, that is. "This car is really a man’s dream, because: so many buttons!" The dashboard of the 1997 Land Cruiser is full of fancy gadgets like a 14-button automatic climate control, auto antenna, radio with cassette and CD player, a digital clock, the button for the diff lock, and this one also has an aftermarket DB radio built in. And look at these fancy sliding windows in the back! Our Land Cruiser also features an automatic moonroof. The rear door can be opened in two sections, which makes it easy to load long, flat cargo, or to relax a little. Another thing that can be opened in two sections is the front arm rest. This provides a lot of storage while keeping your stuff easy to reach. So... What is our conclusion? If you want a compact and economical car to get some groceries... Wait. Why would you want that? This car is the real deal, you’re going to get groceries with this car if you're throwing a party, a big party. This car is meant to be rough, in a comfortable fashion. Доброго времени суток, я конечно не понимаю по вашему но уважаю ваш язык . Машинка супер и я хотел бы именно такого же красавца и как его можно купить за ранее спасибо. That would fetch $40k over here in Australia!!!! Very well sought after in the nordic countries also. Left hand drive though. We definitely need to get this thing over there! Luxury Car Report, any immaculate 80 series, with HD-FT 24v engine fetches huge money. They normally have on average 450,000 k’s and in average condition, then still fetch $25k. Massive following over here and regarded as the best model ever made. Glad you enjoyed! 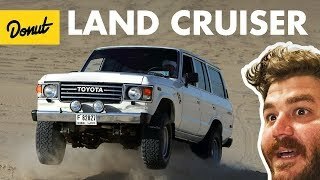 Landcruisers are awesome solid machines! It certainly is a beast! +summer jung chhetri Thank you! Will do when we come across one! Maybe global, but locally it was freezing cold! Is this one RHD? Diesel? How much? It's located in Holland, but the owner currently has no plans to sell it. Yes, it's RHD indeed and it's a diesel. How much in terms of price/value? Gorgeous Mustang in your avatar by the way! +moutik scania Thank you for watching! My favorite car of all time, the FZJ80 ticks all the boxes. 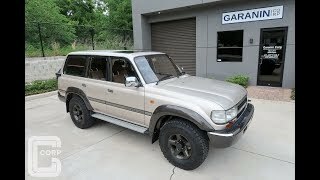 Luxury Car Report your car cannot be in top nick with a millage like that..... 20mpg is like 14l pr 100km...... my LC HDJ 80 does around 9/10l pr 100km, it has been tuned with 3 inch turbo back exhaust, Safari intercooler, more boost, adjusted pump, new injectors..
We did not even get 20 mpg with the diesel, but 12 mpg on average really sends your money down the drain. I must say I was pleasantly surprised by the Ford Expedition, which did >24 mpg on average (on regular gas). Coming from the America, I can only dream of diesel FZJ80! We only received the petrol version, which gets an abysmal 11-13 mpg!! 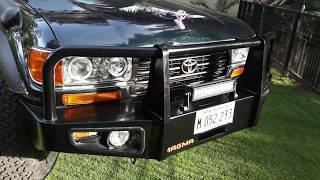 Do you own a Toyota Landcruiser 1HD-FTE 100 series?